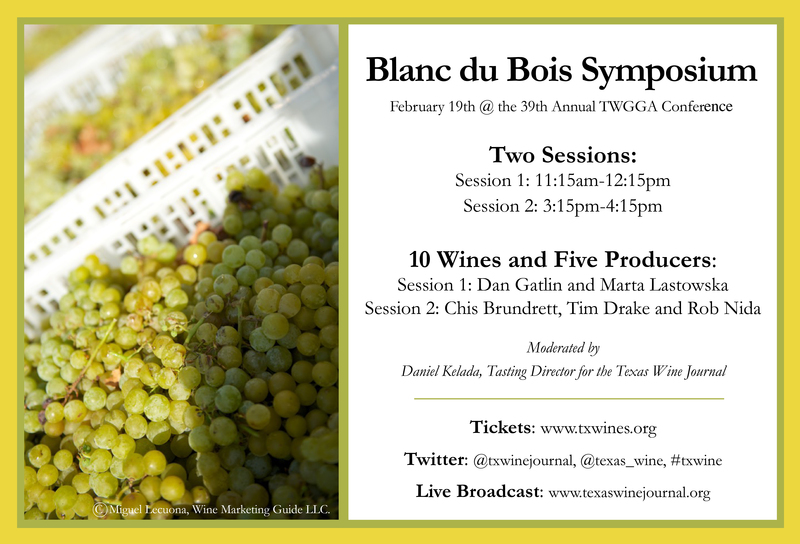 The Texas Wine Journal is hosting a Blanc du Bois Symposium at the 39th annual Texas Wine and Grape Growers Association conference being held on February 19th from 11:15am-12:15pm and 3:15pm-4:15pm at the Embassy Suites in San Marcos. The Symposium will be structured as a moderated panel discussion featuring Dan Gatlin- winemaker at The Vineyard at Florence and Marta Sanchez Lastowska- winemaker at Haak Vineyards and Winery in the first session. The panel in the second session will comprise of Tim Drake- winemaker at Flat Creek Estate, Chris Brundrett- winemaker at William Chris Vineyards and Rob Nida- winemaker at Compass Rose Cellars. Both sessions will be moderated by Daniel Kelada, tasting director for the Texas Wine Journal. The goal for the Symposium is to gain further insight on best practices for dealing with Blanc du Bois in the vineyard and winery and how that reflects what eventually becomes bottled. In addition to a moderated discussion, each session will feature a flight of wines that will be tasted with the direction of the respective winemaker as well as a question and answer period for the audience. This Symposium is the first ever breakout session offered during the annual conference that features a tasting element.